I snagged a post once that had links to tons of crock-pot recipes and have been trying them over the last few months with some winners and some that didn't work. I first tried this recipe from Teaghan at Half Baked Harvest for Thai Peanut Chicken and Ramen Noodle Soup using her crock-pot instructions and Ramen noodles. The taste was great, but I wasn't totally thrilled with the results. In the crock-pot, the sweet potato disappeared and the Ramen noodles were too hard to get right, I only left them for a few minutes before serving, but they quickly became glue-y. The change I did make that worked was doubling the chicken as my family prefers a meatier soup and I personally like a mix of chicken breast and thighs. As I liked the flavour overall, I wanted to give this recipe another try using her stove top directions, a different type of noodle cooked separately and making a few small changes to the cooking order. One bonus would be the leftover soup and noodles could be stored in separate bags. No soggy noodles when reheating! While visiting my daughter in Kingston, Ontario, I decided it was the perfect time to try it again. They like spicier food than my husband does and are both adventurous eaters. Her boyfriend usually comes home much later from work, so cooking and storing the noodles separately would work better with their lifestyle. I chose to use rice noodles this time as they are his personal favorite. Early in the day I made the soup in one pot and let it sit covered on the stove. I then prepared the rice noodles according to package directions, rinsed them in cold water, drained them and tossed them with a little sesame oil to keep them from sticking. The noodles were then popped into a large Ziploc bag. At serving time I chopped a small amount of cilantro and peanuts while the soup was gently reheating. When ready, they each grabbed a bowl, added some rice noodles, ladled on the soup and sprinkled cilantro and peanuts to taste.. I'm happy to say this worked well and I will be making this spicy soup again. Thanks to Teaghan for the great recipe. Although I made a few minor changes, the flavor combination created with ingredients was all hers. You can check out the original recipe at the link above. 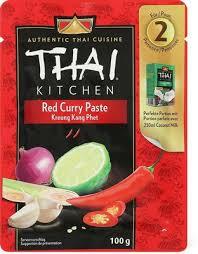 Cook rice noodles according to package directions. Rinse with cold water and drain. Toss with small amount of oil to keep them from sticking and store in a sealed Ziploc bag. Cut Chicken breasts and thighs into bit size pieces - small strips or cubes. Heat a large pot over medium high heat. Add 1 T oil and brown chicken on all sides.. Remove and set aside. Add another tablespoon of oil, garlic, red peppers, mushrooms and ginger. Saute for 5-10 minutes.. Add in the curry paste and smoked paprika, stirring until the curry paste has coated the veggies. Add the chicken pieces back into the pot along with the diced yam, coconut milk, 3 cups of the chicken broth, soy sauce, and fish sauce. Simmer gently until chicken is cooked through and yams are tender. In the meantime, add 1 cup of chicken broth to a heat safe bowl and microwave on high for 1 minute or until very hot. Carefully stir in the peanut butter until completely smooth. Add to soup along with lime and brown sugar. Stir gently until fully incorporated. 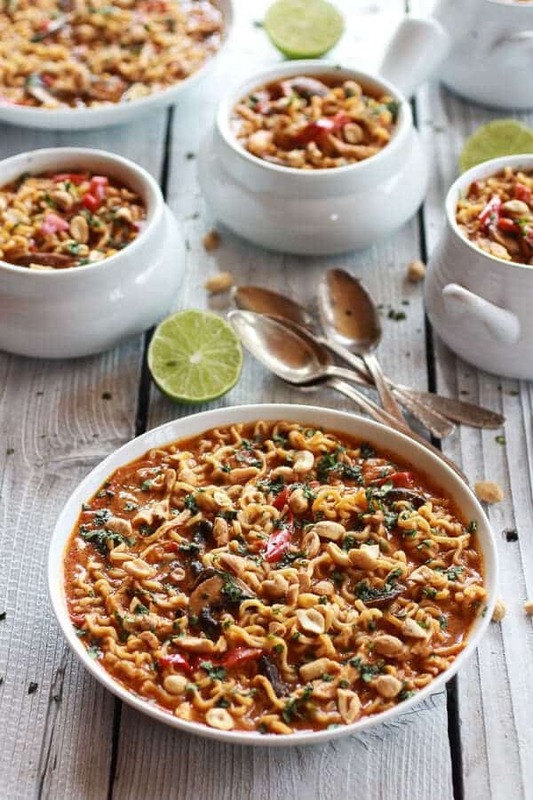 For each guest, place noodles in bottom of large soup bowl, spoon the soup on top and offer bowls of peanuts and Cilantro to be sprinkled on top.